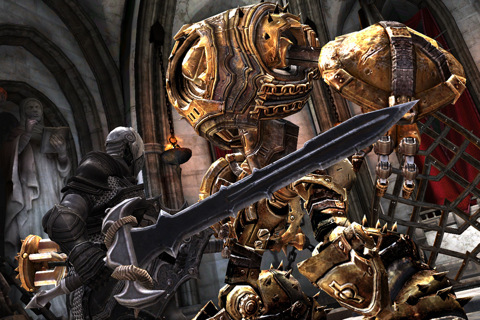 Infinity Blade is a remarkable sword fighter exclusively developed to run on the iPhone, iPad, and iPod touch by Epic Games & ChAIR Entertainment. Infinity Blade features awe-inspiring hi-res graphics and captivating gameplay combined with a first-rate soundtrack that will have you glued to your iOS device in no time. 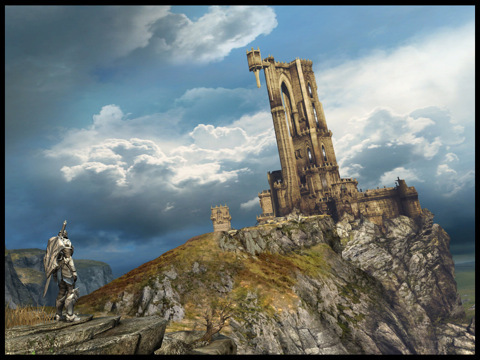 Infinity Blade comes in the form of a universal app, so one purchase runs on both the iPhone/iPod touch plus the iPad in full HD resolution. An intro movie covers the plot as to why you must fight Titans of God King in the Dark Citadel and help free people from his legacy of darkness. Your first experience with Infinity Blade comes in form of a tutorial that builds as the lone knight starts traveling amidst castles and fortresses. You are initially supported with stop and learn style tutorials that introduce you to the game’s action packed levels with ease. Non-fighting movements consists of tap to move to location, plus tap to pick up items. Blade fights use on screen swipe gestures to attack the enemy and tap and hold to block. You can also move left or right as to dodge the attacks, and finally there are spells that you can cast as you build up enough success points during each fight. Because gameplay in Infinity Blade is so well thought out and natural, learning the game via the tutorials feels almost too easy at times. Attacks and blocks are super responsive and so fluid that you might mistake this for a console game. Overall while it does get a little repetitive at times, the gameplay was highly adrenaline inducing and to a certain extent addictive. I can’t say enough about how sharp and stunning the graphics are in this game. The game uses close-ups as well as distant shots effectively so that you get a realistic view of your surroundings while in discovery mode, followed by up close camera angles during battles; an eloquent style that details the fluid and lustrous 3D character depictions, weapons and surrounding environments. All this perhaps owes a big thanks to the award-winning Unreal Engine 3 utilized in the game. Level up your knight’s sills using treasures, swords, shields, armors and other magical objects you pick up along the way. Achievements and Leaderboards are supported via Game Center integration. So, what’s missing for now but coming soon? Multiplayer. Epic Games has also promised additional arenas, new weapons (swords, sheields, helmets, rings) and even more enemies to slash away. The game’s simplistic app icon is a dash too boring and could be improved to better represent the powerful graphics within Infinity Blade. Overall, Infinity Blade is a high production value iPhone title that is well worth checking out even with the high end price tag. AppSafari review of Infinity Blade was written by Joe Seifi on December 10th, 2010 and categorized under Action, App Store, Featured, Fighter, Games, iPad apps, Universal. Page viewed 5061 times, 1 so far today. Need help on using these apps? Please read the Help Page.